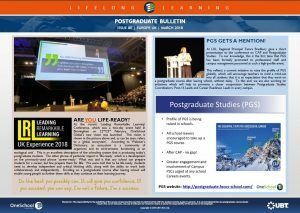 The 80th Postgraduate Bulletin (March 2018) is now online! This month’s issue gives an insight into the recent OneSchool Conference in Birmingham, entitled ‘Leading Remarkable Learning’, where Postgraduate Studies was given a formal promotion to professional staff and campus management teams. Also featured is a further positive appraisal of the Apprenticeships initiative, for your interest. ← After CAP – No GAP!